We’d love your help. Let us know what’s wrong with this preview of Chicken in Mittens by Adam Lehrhaupt. To ask other readers questions about Chicken in Mittens, please sign up. First sentence: Zoey stepped out of the barn. So did her best pig, Sam. Fresh snow covered the farm. "We can be explorers!" said Zoey. "It's cold," said Sam. "Arctic explorers!" said Zoey. Premise/plot: Zoey LOVES adventures. Sam, well, he's a great friend, a sidekick, to Zoey. Even if he doesn't always show the same passion or zeal for adventure as his friend does. In this one, the two set off to discover the pole. Will they find it? Well, they'll find something that's for sure! My thoughts: Thi First sentence: Zoey stepped out of the barn. So did her best pig, Sam. Fresh snow covered the farm. "We can be explorers!" said Zoey. "It's cold," said Sam. "Arctic explorers!" said Zoey. My thoughts: This I Can Read early reader stars the characters from Chicken in Space and Chicken in School. 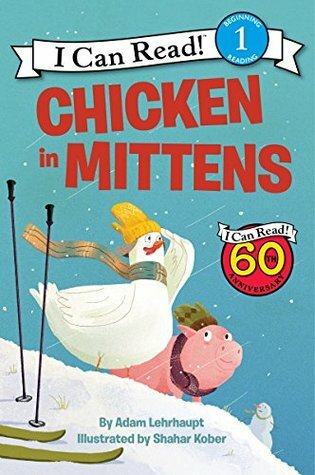 If you loved those picture books, you should definitely seek out Chicken in Mittens. I should have known that any beginning reader by Adam Lehrhaupt would be both useful for literacy and freakin' hilarious. Yeti, indeed! I love the comic timing of this book, and I continue to be a great fan of Lehrhaupt. More! Fun story about an enthusiastic chicken and her reluctant pig friend. Zoey wants to take a trip to the North Pole, even though she's not sure how to get there. Sam follows along, accidentally unraveling his mitten. When they finally find the North Pole (a scarecrow pole) they follow Sam's yarn back home. Zoey the chicken and Sam the pig decide to go out adventuring in the snowy world. They are going to be arctic explorers! They wear their mittens (in an unconventional way) and set out to explore the world beyond their fence. A cute winter adventure with some slightly silly animals that beginning readers should find utterly delightful. Sure to make kids smile if not laugh. Adam Lehrhaupt's language is perfect for this age group. The words are simple but the story and illustrations have a lot of child appeal. The chicken named Zoey reminds me a bit of Minerva Louise--a bit misguided but always acting with a big heart--and I adore her relationship with "her best pig, Sam." What a couple of sweeties! Also, I was very impressed by the mitten that kept leaving string behind but never got any smaller. Cute story for beginning readers. Zoey, an adventurous chicken, and her pig, Sam, go in search of the North Pole, after all, it's so cold outside. Through fences and up big hills they journey. How do they know when they've arrived? Just ask the Yeti ... or is that a scarecrow? Very cute story and adorable illustrations. decided not to do for storytime because of the minerva louise chicken in the snow book. it is cute, could be interactive, was not very big, would be hard to see in the back of the room. Cute, silly, and easy for kids to follow along. It’s also a great book for kids who are learning to read. Simple beginning reader with a clear story. Two by Adam Lehrhaupt on my list. Fun for winter k-1 guided read. Funny! Can't help but love these characters. Two farm animal friends play in the snow together. With some imagination and some humor, they have a great time and make their way home to a cozy evening.